FAPAC - FAPAC at the Ballpark! One entry at group rate. Does not include concessions. Join us for a night of networking and baseball! Our hometown Nationals will be taking on the New York Yankees. 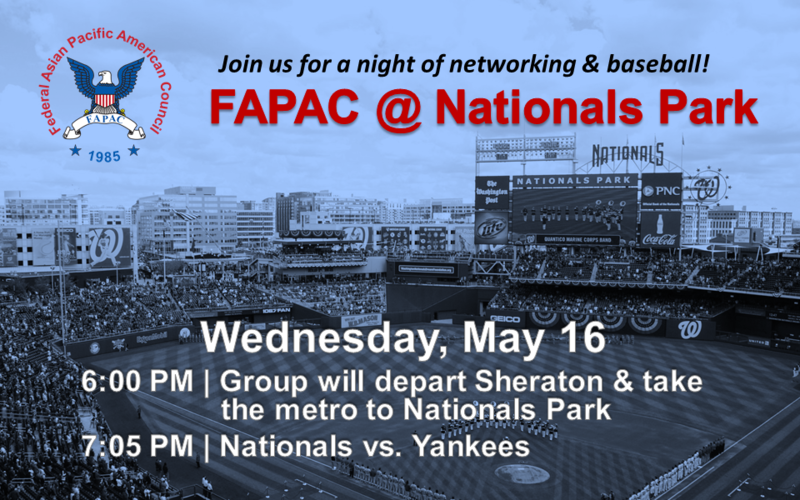 6:00 pm | A group will depart from the Sheraton Pentagon City (900 S. Orme St, Arlington, VA) and take the metro (Pentagon City station) to Nationals Stadium. Price of ticket is good for one entry into the park and does not include concessions. Visit the Nationals website for more information about the ballpark.